As you may have heard Electric Bird Noise has a new album out & it is pretty mighty. Here's your chance to preview the whole thing before buying with a sale price! Launch in external player to listen! Electric Bird Noise returns defying all expectation with an album of new wave dance & 1970s synth experiments. New Order is among the best bands of all time. I say that with the conviction and certainty of a long time fan, and I'm sure that many of you would agree with me. And if "Desert Jelly" is any indication, I'm quite certain that Electric Bird Noise feel the same way as I do. "Desert Jelly" is an album filled with bombastic hooks and subtle nuance that brilliantly capture the spirit and essence of New Order, while simultaneously creating something of their own that's both contemporary and vital. Electric Bird Noise is Brian Lea McKenzie...an intriguing fellow who has been in the business of writing and recording puzzling underground music for the past fifteen years. Desert Jelly is a bit of a departure in terms of sounds and styles, as the album offers a more conventional approach...with many of the songs having more of an accessible pop feel. But this is not a sell out venture, nothing could be further from the truth. McKenzie's songs remain vibrant and inspired. True to the claim of the accompanying press release, these songs recall classic artists from the past like New Order, The Cure, Depeche Mode, Gary Numan, Brian Eno, and Todd Rundgren. Another interesting twist here is the fact that three of the tracks feature lead vocals courtesy of Brian John Mitchell (Remora). Mesmerizing underground pop music with a decidedly experimental slant. Eleven mind-bending tracks here including "Dunebuggy," "As the Glitter Glows," "I Come From The Earth," "Carnegiea Gigantea," and "The Theme From Impatiently Yours." Top pick. Electric Bird Noise gets strange. The title alone should indicate such a strange trip. Mixing the obvious assumption with a slight misspelling ‘Desert Jelly’ offers a bizarre trip through noise, nostalgia, and new wave. Aspects of the album are completely habit-forming. Some of these songs will get stuck in the head. What’s best is how the closer to pop Electric Bird Noise gets, the better the album succeeds. More conventional does not mean a basic, simple song. Rather conventional is a loosely defined term referring to at least some aspect of pop sensibilities. That means melody. That also means noise and ‘Desert Jelly’ gets loud, really loud at times. ‘dunebuggy’ begins with a stomp. The whole song is a riff played over and over again. Honestly this works wonders. Introducing the album with a sense of fun is good as it gives the listener some idea of what they are about to explore. ‘peter hook’ is one of the memorable tracks on the album. Beginning off quite slowly it builds and blasts off. A few songs have split personalities like ‘welcome to static beach’ which might as well be two entirely separate tracks. What’s nice about ‘welcome to static beach’ is the underlying sense of hope under the shaggy dog like riff around the 2 and a half minute mark. Towards the end Electric Bird Noise explore more ‘dance-inspired’ pieces like the twee ‘carnegiea gigantea’ and glo-fi ‘the theme from impatiently yours’. Desert Jelly is an eclectic mix done right. Electric Bird Noise has developed a reputation for a guitar-driven, experimental and atmospheric sound. But on the band’s latest album, Desert Jelly, which Silber Records released a couple of weeks ago, the band defies expectations with an album devoted to synths and New Wave. “Dune Buggy” is the first track off the new album and in some way it reminds me a little bit of prog rock and a bit of a band like the Big Sleep. In any case, the track has a muscular buzzing, almost drone-like funk — it’s not a typical funk you’d expect but it comes from weird angles. The project is an 11-song mix showcasing McKenzie’s more than capable multi-instrumental talents and songwriting craft. 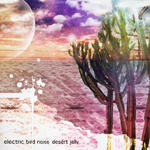 “Desert Jelly,” McKenzie’s eighth Electric Bird Noise CD, features the use of the Prophet T8 synthesizer, and additional analog instruments. At times reminiscent of Todd Rundgren’s 1970s-era experimental rock, as well as 80s influences (ala Depeche Mode, and others), “Desert Jelly” will be ear candy to fans of creative instrumental multi-tracking mixing old school sounds with modern sensibilities.